Heading out towards the recycling depot and well beyond, you can see the undeveloped land of Lot 1 on the west side of Mt. Gardner Rd. It surrounds the Public Works Yard and gas station. It is the subject of our current rezoning discussion and much of this web page is dedicated to the details of the proposal. However, it is only a focus point for a much wider discussion about our collective vision for the future of the Community Lands. Currently, Lot 1 is designated as “Rural” in the Official Community Plan, and it is zoned “Rural Residential 1” in the Land Use Bylaw. We are proposing to change this designation to something more useful to meet the community’s needs - a comprehensive development zone to make portions of Lot 1 available for development over the coming years. To make these changes, we have introduced two amendment bylaws and are proceeding with public consultation. Bylaw No.433, 2017 would amend the zoning in the Land Use Bylaw from “Rural Residential 1” to “Comprehensive Development 21”, with four “sub-areas”. More background information about the proposed bylaws can be found under Background Information, below. As you can see on the map below we are proposing to divide Lot 1 into four distinct areas. It would be a mix of residential, light manufacturing and contractor services. Area 1 is the largest parcel at just over six acres. The proposed bylaw would allow for residential and other uses including workshops, warehouses, live/work spaces and businesses that require large interior spaces. As you read the proposed uses, you will also notice the restrictions. Things like noise, odour and disturbance will be strictly controlled. Part of the Islands Trust philosophy is the desire to create a level of economic autonomy on each island. Having local industry reduces our dependence on the major urban centres nearby. 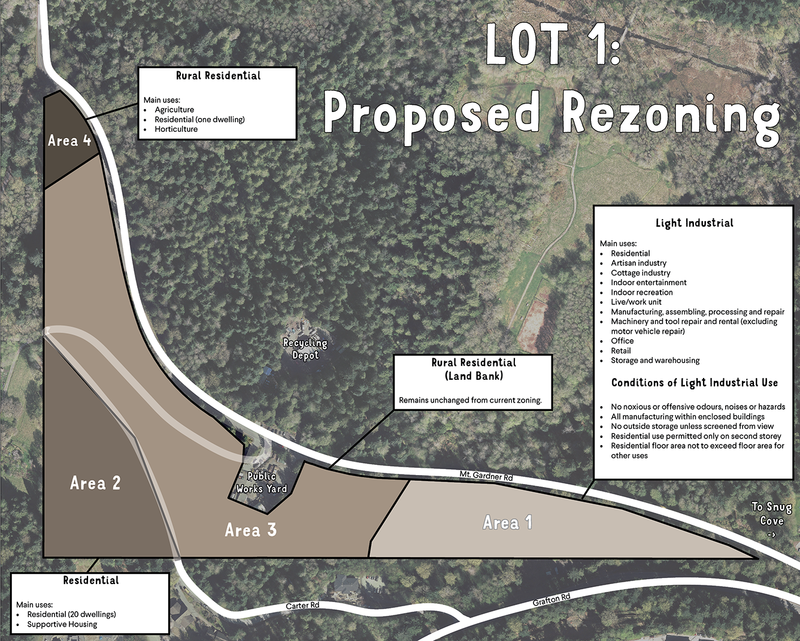 Planning for Artisan Square on Bowen Island began in the late 1980s. The first building was a brewery with two apartments above. The second building was an addition to the brewery along with a food condiment producer and packager. Again, there were two apartments above. The third building housed a sign-making shop, a wine-making shop, a flooring contractor, a jeweler, various offices and two more apartments. Today, Artisan Square is completely built out. It has moved far beyond the original artisanal workshops originally envisioned, yet the need and desire for local employment areas remains. Over the last 30 years, real estate values in our region have undergone a profound change. The value of land for residential development far exceeds what can be garnered from contractor’s shops and mini storage. Municipalities throughout the Lower Mainland are striving to hold on to their light manufacturing areas while developers are asking to re-zone land for residential use. Whistler zoned an area called Function Junction specifically to provide land for small-scale service industries. We have an opportunity within our Community Lands to create a zone that can supply the land needed not only for artisanal manufacturing but also for the services every community needs. A key component is to provide reasonably priced large interior spaces with high ceilings. The area under consideration provides that possibility. But more importantly, the Municipality would retain ownership of the land and have control over everything built. Our Official Community Plan, updated in 2010, encourages local stakeholders to propose an area for light industrial uses. It notes the desirability of businesses providing these services in a single location instead of scattered across the island. As you will see below, the topography of Lot 1 is most favourable for building in Area 1 because it has the most level ground. The steep slope along the eastern edge of Area 1 would create a natural barrier between the light industrial area and the school to the northeast. Area 2 is just over four acres, above a forested area with agricultural land to the west and Belterra Co-Housing to the south. We are proposing to zone it for 20 attached homes. It has water, electricity and road access nearby and is near Island Pacific School and Cates Hill Chapel. We feel that its size, orientation and location make it ideal for a small residential neighbourhood. It could potentially be used for co-op housing. Area 3 contains riparian areas along two creeks, surrounds the Public Works yard and has some areas where detailed analysis has not yet been done. It will remain unchanged with the current zoning of Rural Residential and will be left in our land bank. 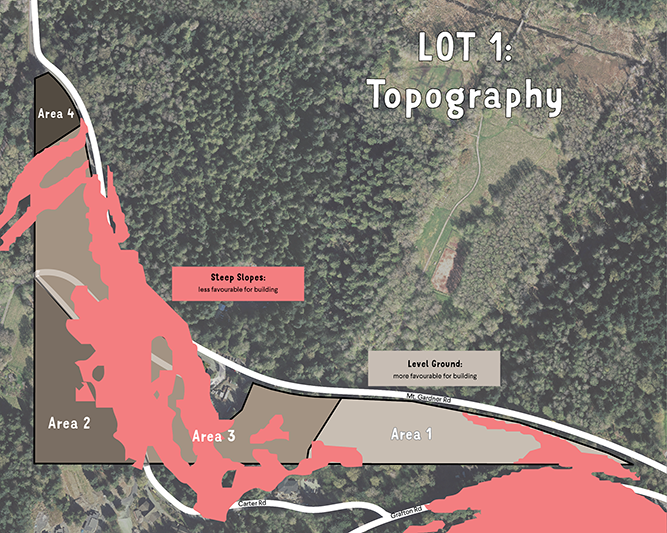 Area 4 is a small piece of land at the tip of Lot 1, farthest away from Snug Cove and on the other side of Guild Creek. It is in the Agricultural Land Reserve and surrounded on three sides by Crippen Park. The intention for this area is to create a single residential lot and sell the property. Any proceeds from the sale can go towards capital projects such as the Community Centre on Lot 2. Council has given first and second reading to the amendment bylaws. Staff completed public information sessions, neighbourhood meetings and walking tours throughout April, May and June. A Public Hearing will be held on July 30, 2018. See below for ways you can get involved. Submit your comments to Mayor and Council at the Public Hearing on July 30, 2018. See the top of the page for more information about the Public Hearing. Wednesday, April 18th: Meeting with local contractors and service providers. 7 pm at Municipal Hall. Thursday, April 19th: Walking Tour of Lot 1. 2 pm at Carter Road below Cates Hill Chapel. Sunday, April 22nd: Walking Tour of Lot 1. 2 pm at Carter Road below Cates Hill Chapel. Tuesday, May 1st: Public Open House. 4 - 7 pm at Municipal Hall. 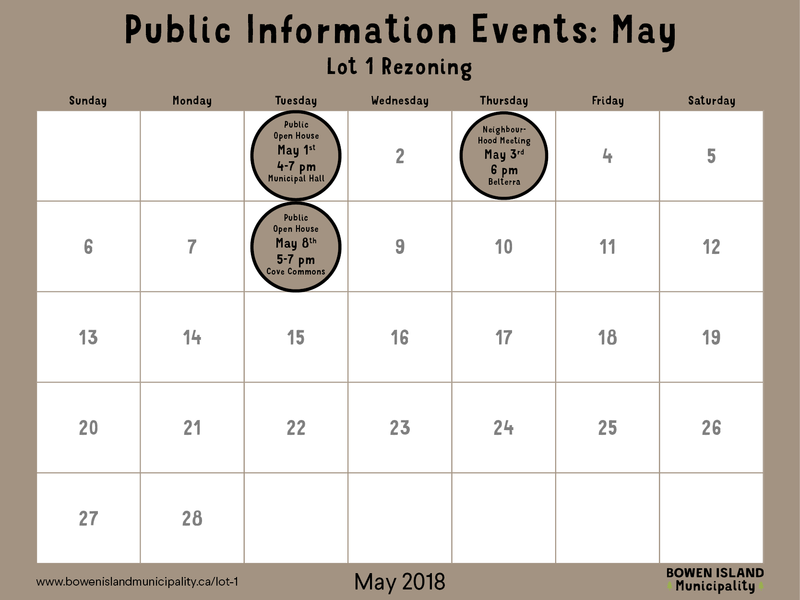 Thursday, May 3rd: Neighbourhood Meeting. 6 pm at Belterra. Tuesday, May 8th: Public Open House. 5 - 7 pm at Cove Commons. 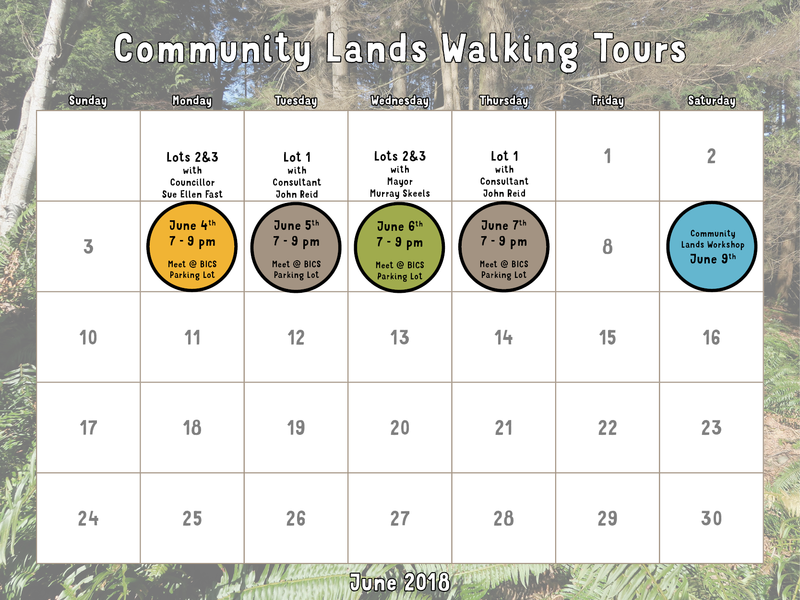 Tuesday, June 5th: Walking Tour with John Reid. 7 - 9 pm, meet at BICS parking lot. Thursday, June 7th: Walking Tour with John Reid. 7 - 9 pm, meet at BICS parking lot. Saturday, June 9th: A Workshop on the Future of our Community Lands. 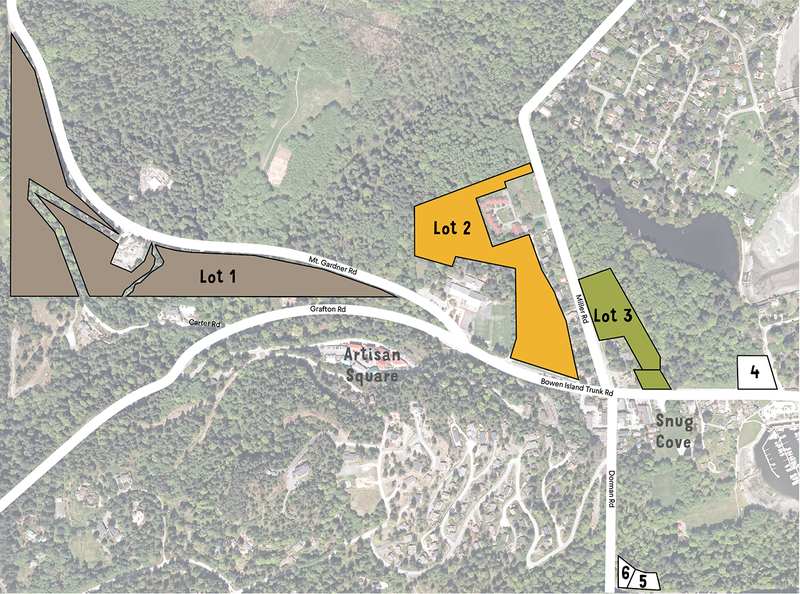 It was Moved and Seconded That Council provide direction regarding the planning and development of Community Lands Lot 1, and specifically direct staff to bring forward, for Council's consideration to a future Committee of the Whole, a further report with bylaws to amend the Official Community Plan and Land Use Bylaw to rezone the area on the north side of Guild Creek to Tourist Commercial (TC1) or Retreat Commercial (RC) with of up to eight rooms for tourist accommodation, and to submit an application to subdivide this proportion from the remainder of Lot 1. CARRIED Councillor Mason in Opposition. It was Moved and Seconded That Council provide direction regarding the planning and development of Community Lands Lot 1, and specifically direct staff to bring forward, for Council's consideration to a future Committee of the Whole, a further report with bylaws to amend the Official Community Plan and Land Use Bylaw to rezone the southwest corner of Lot 1 bounded by Carter Road for up to 20 detached or attached primary living units. CARRIED Councillor Fast in Opposition. That Council direct staff to draft an application to exclude portion of Lot 1 north of Guild Creek from the Agricultural Land Reserve. That Council direct staff to amend bylaw No. 433 by allowing residential as a permitted accessory use in Area 1.
vi. All adjacent landowners and residents. That Council direct staff to report back following the completion of the Community Lands Workshop on June 9th. That Council, as a condition of rezoning, require a restrictive covenant be placed on title of Lot 1 requiring the completion of a Transportation Management Plan and a Storm water Management Plan prior to approval of subdivision. That Council direct staff to amend Bylaw No. 433, 2017 to reduce the required parking to 0.5 spaces per residential unit for Lot 1, Area 1 of Community Lands. That Bylaw Nos. 432 and 433 be amended to include dwelling as a principal use for Area 1; and That Council request the Manager of Planning and Development to come back to Council with a revised Bylaw to reflect that change. That Bylaw No. 432, 2017 cited as “Bowen Island Municipality Official Community Plan Amendment Bylaw No. 432, 2017” be read a second time as amended at the June 25, 2018 Council Meeting. That Bylaw No. 433, 2017 cited as “Bowen Island Municipality Land Use Bylaw No. 57, 2002, Amendment Bylaw No 433, 2017” be read a second time as amended at the June 25, 2018 Council Meeting. That Bylaw No. 432, 2017 and Bylaw No. 433, 2017 be referred to a public hearing. Daniel Martin, Island Community Planner, provided a presentation, referral letter and report regarding draft Official Community Plan Bylaw No. 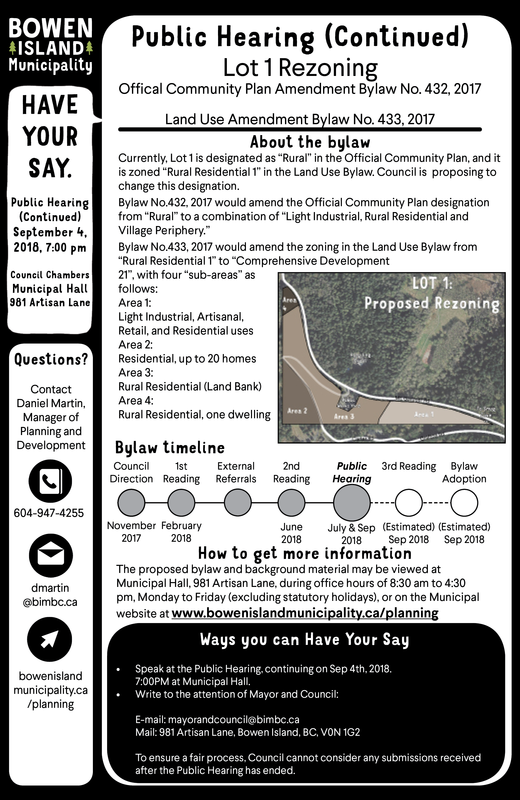 436, 2017, a bylaw to amend Bowen Island Municipality Official Community Plan Bylaw No. 282, 2010 and draft Land Use Bylaw No. 437, 2017, a bylaw to amend Land Use Bylaw No. 57, 2002 as concerns the rezoning of Lot 1 of the Community Lands. Discussion ensued. 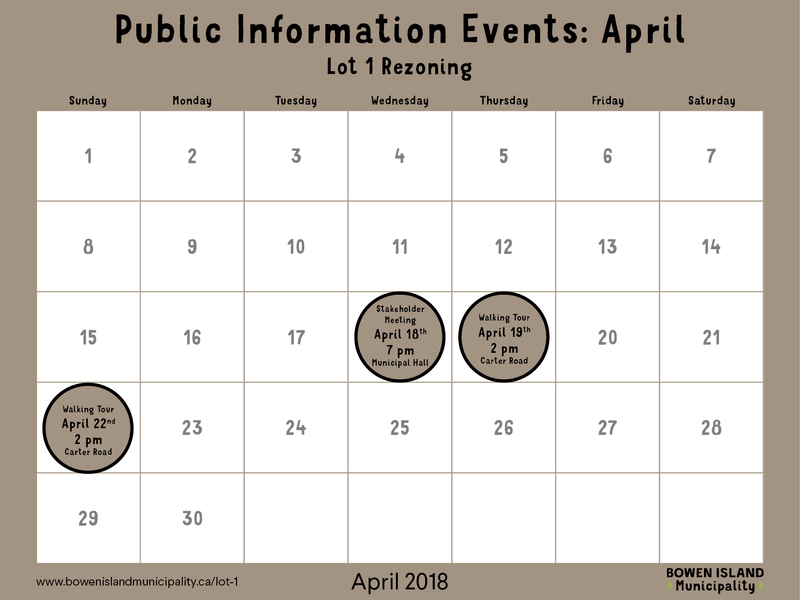 It was Moved and Seconded That the Advisory Planning Commission (APC) provide the following comments to staff regarding the rezoning application for Lot 1 of the Community Lands (draft Official Community Plan Bylaw No. 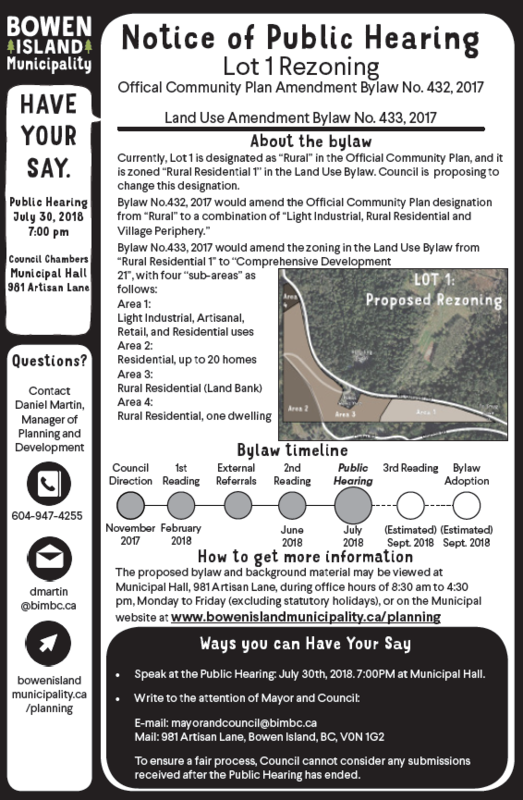 436, 2017, a bylaw to amend Bowen Island Municipality Official Community Plan Bylaw No. 282, 2010, and draft Land Use Bylaw No. 437, 2017, a bylaw to amend Land Use Bylaw No. 57, 2002 as concerns the rezoning of Lot 1 of the Community Lands): 1) The APC supports the removal of the northwest corner of Lot 1 (the parcel proposed to be rezoned to Tourist Commercial 1 (TC 1)) from the Agricultural Land Reserve (ALR) and, if that parcel is removed, the lot line being adjusted to align with the creek. 2) The APC supports the rezoning of the central parcel of Lot 1 from Rural Residential 1 (RR1) to Rural Residential 3 (RR3) (LUB), and Rural (R) to Rural Residential (OCP) for housekeeping reasons. 3) The APC recommends that future rezoning of the central parcel of Lot 1 be done with caution in order to discourage development that is detrimental to the surrounding properties. 4) The APC supports the rezoning of the southwest parcel of Lot 1 to Village Periphery (VP). It was Moved and Seconded That the Advisory Planning Commission support the rezoning of the parcel in the southwest corner of Lot 1 to Village Periphery (VP); and, That the Advisory Planning Commission recommend and encourage the construction of a variety of housing types and sizes, both rental and fee simple; and, That the Advisory Planning Commission further recommend that the size of primary buildings (dwelling units) be changed from a maximum of 200 square metres to an average size of 200 square metres to encourage variety. The APC recommends that Lot 1 of the Community Lands be zoned with as much flexibility as possible. removal of reference to colour in section #2 of Exemptions. The APC supports zoning for attached dwellings, but encourages a maximum building size of 575 sqm excluding garages. The APC supports leaving Area 3 as Rural Residential with future development to be determined. The APC supports the exclusion of this area from the Agricultural Land Reserve. That the use of natural assets be considered regarding ecological protection such as bioswales, soil cells and the creation of a stormwater wetland. Relationship between transportation costs and a reduction of people's needs for two, or even one cars. The Committee decided to reiterate the recommendation made to Council at the November 28, 2017 TAC meeting and add an additional clause that would specify a residential zoning preference. That Council consider adding residential as a principal use. That the Transportation Advisory Committee recommend that parking requirements in Area 1, Lot 1 of the Community Lands be reduced to .5 per unit. That the Parks, Trails and Greenways Advisory Committee recommend that a complete biophysical inventory and hydrological study be conducted for all of Lot 1 to the standard of that conducted for the Grafton Lake Lands project prior to rezoning. Therefore, it be resolved, that the Parks Trails and Greenways Advisory Committee recommend that a restrictive covenant be placed on Lot 1 of the Community Lands so that any development would need to demonstrate best erosion and sedimentation control practices before the development occurs, for example, utilization of natural assets, green infrastructure and natural processes. Therefore, it be resolved, that the Parks, Trails and Greenways Advisory Committee recommend that a 10 metre wide covenant along the southeastern property line of Area 1, Lot 1, that is north of Lot 5 up until the western property line of Lot 5, remain as undisturbed existing natural vegetation, to protect the integrity of the trail experience, the safety of trail users and pedestrian access. The Parks, Trails and Greenways Advisory Committee recommend that a 10-metre restrictive covenant be placed on Lot 1 along Mt. Gardner Road to protect the sensitive riparian area and the water quality of Terminal Creek. The EDC encourage consideration of expanding Area 4 south to meet Carter Road and allow for additional tourist commercial uses in the sub-area as the EDC believes that an eight-bedroom accommodation option is too small to be viable.